Rompi Rompi to Mavi Mavi, kick off your shoes and get ready to review classic Greek wedding dance moves. If there’s one thing you can always anticipate at a Greek wedding, it’s dancing. And then, more dancing. Oh, and maybe a little more dancing to finish off the night. 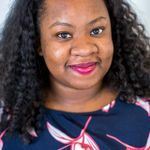 Whether you’re looking to add some Greek wedding dance to your otherwise modern Greek wedding or looking forward to attending your first Greek wedding as a guest, you will want to have your steps together before busting a move. It’s true that you’ll want to be prepared to hang, rhythmically, at your next Greek wedding, but we promise, none of the Greek wedding dances are too complicated that a few YouTube video tutorials can’t get you straightened out. Check out these Greek wedding dance videos before your big day. Hang back, this bride’s got this Greek wedding dance! One happy couple embraced Greek wedding dance for their first dance as a couple. 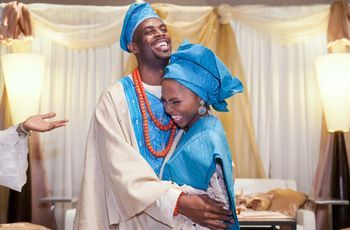 Instead of the Western tradition of the couple dancing as guests look on, the bride starts off the dance holding her husband’s hand. The rest of the wedding party and guests all grab hands and, pretty soon, nearly the entire room is joining in the couple’s first dance. Helping her along was the most perfect song, “Orea Pou 'ne I Nifi Mas, Simera Labi O Ouranos,” which means “The Bride Looks Beautiful, Today The Sky Is Bright” by Kostas Mentzelopoulos. Not quite Zorba the Greek, but close enough. So, “Zorbas” (or, formally, Sirtaki) isn’t a traditional Greek wedding dance song, but it’s one of the most famous Greek pop songs. Thanks to its appearance in the 1964 blockbuster movie Zorba the Greek, “Zorbas” is forever imprinted in the minds of Americans (Greek Americans included) as one of the culture’s primary celebration songs. A nod to this song and movie in My Big Fat Greek Wedding didn’t hurt the wedding association, either. 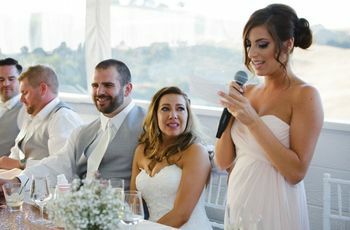 All of that to say, don’t feel pressured to learn the moves to this dance before your next wedding, unless you really want to show off for your Greek friends or family. Non-dancers, this is your time to shine. You’ve got to love a Greek wedding dance that emphasizes style and enthusiasm over rigid choreography. And, thankfully, the Tsamiko is that dance. If you’ve ever been to a Greek wedding, this is probably the folk dance that stuck out most in your mind. There’s not a lot of form required, and, just about anyone can quickly get the rhythm of this jubilant Greek wedding dance that gets everyone moving. Essentially, dancers link arms at the shoulders and dance around in a huge circle, kicking one leg at a time. The next time you see the entire wedding reception descend on the dance floor at a Greek wedding, know it’s your time to boogie down. This one’s for the fellas. Grooms, best men, groomsmen and other menfolk, the Zembekiko is the Greek wedding dance for you. 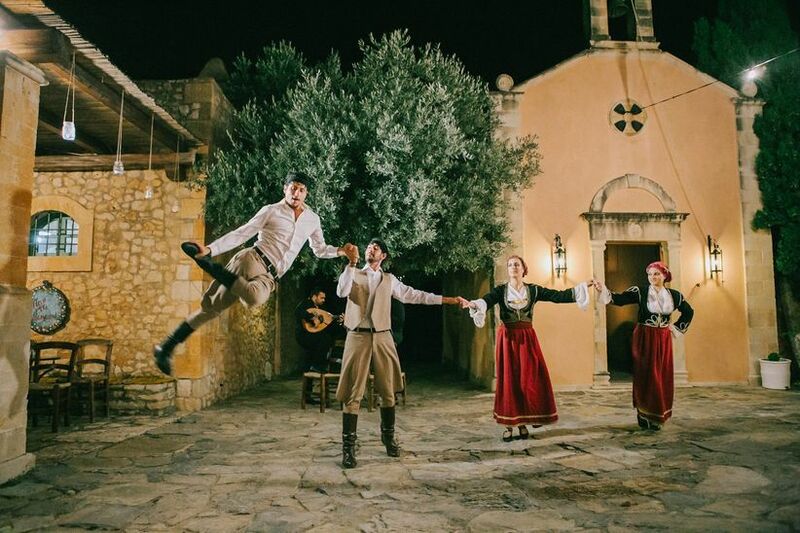 An enduring Greek wedding tradition, this is another dance typically performed in a circle. 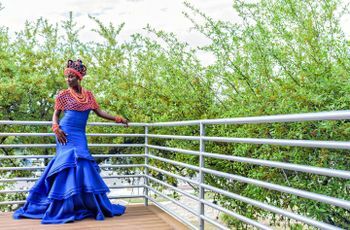 Instead of the jovial free-for-all of a Tsamiko or a Zorba’s, though, the Zembekiko celebrates the groom and his buddies. Led by the groom, other men are welcome to join in or kneel alongside the dancers and clap to the beat. Now, it’s the ladies’ turn for a Greek wedding dance. Don’t think a Greek wedding could get away with a triumphant moment for the guys and not include the women. Kalamatiano is another folk move often performed as a Greek wedding dance just for the bride and her attendants and family. Similar to the Zembekiko, the bride starts off in the middle with her MOH to the left. Soon, other women at the wedding join hands and encircle the two until the dance floor becomes one big concentric circle of dancers. Get your dollars ready for the Greek wedding money dance. 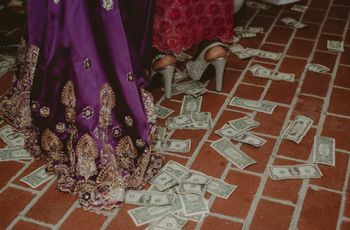 Maybe one of the most famous (and most fun) aspects of a traditional Greek wedding, the money dance, or dollar dance, is festive and mainly adhoc. The concept is exactly what it sounds like — the couple starts a dance in the middle of the dance floor and guests circle around them to either shower them with single dollar bills or pin money on the couple. Music for this tradition varies (be sure your DJ knows a few Greek tunes! ), but "Psintri Vasilija Mou," a Cypriot classic favored by Greek Americans, is a safe bet.